Scientists have uncovered some preliminary evidence for a nuclear physics effect first predicted back in the 1970s. The physics universe you’re about to enter into in order to understand it is especially mind-bending. 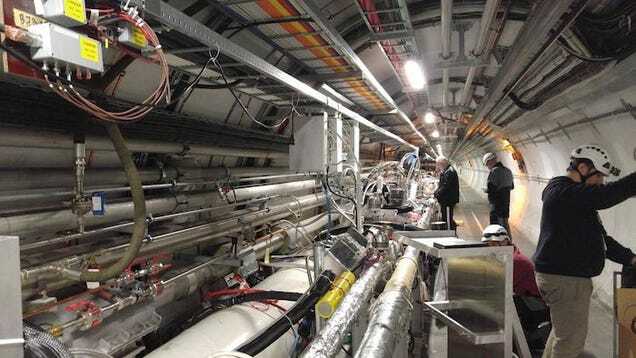 Physicists at the TOTEM experiment on the Large Hadron Collider in Geneva, Switzerland have found evidence for a physical effect called an “Odderon.” It is not direct evidence, but rather some results that would make more sense if this particle existed. In a typical particle physics experiment at the LHC, scientists slam protons together with the hope that they shatter and produce something new and interesting to spot with big detectors. But there’s a whole lot of physics that studies what happens when the protons don’t break apart, and instead just interact with each other and change direction. Back in the 1960s, physicists used an idea called Regge theory to understand the collisions where protons don’t break apart. That theory presented some new ideas: an effect called a “Pomeron” and another called the “Odderon,” as explained by physicist Carlo Ewerz in a more recent lecture. The Pomeron was meant to explain why the glancing protons seemed to be more likely to interact with one another at higher energies. The Odderon helped explain the mysterious differences in the likelihoods that a proton would have a direction-changing interaction with another proton, versus that a proton would have one of those interactions with an antiproton. Today, people still use Regge theory to explain these glancing, non-destructive collisions, in combination with the more detailed “quantum chromodynamics,” or QCD. QCD describes how quarks, the particles that make up protons, interact with one another. Quarks are always connected to one another by a particle called a gluon (so named because it “glues” quarks together). Quarks and gluons contain a special kind of “colour charge,” similar to an electric charge except there are six choices (called red, anti-red, blue, anti-blue, green, or anti-green), rather than two choices (positive or negative). The Pomeron and Odderon ideas have stuck around, and scientists have previously found experimental evidence for the Pomeron, but not the Odderon. QCD describes the Pomeron as protons exchanging an even number of gluons whose total colour charge equals zero, changing direction and then going on their merry way. QCD describes the Odderon as an exchange an odd number of gluons (at least three). No one has actually found an Odderon yet. Searches for the Odderon have involved looking for differences in how likely protons are to interact in a certain way with other protons versus protons interacting with antiprotons. There has been scant conclusive evidence of the Odderon’s existence. Its presence has become a “firm prediction” of quantum chromodynamics, though, writes Ewerz. TOTEM has been measuring a physical parameter called the rho parameter, a number that helps describe how the protons interact both with other protons and with antiprotons. The mathematics of the parameter is probably too esoteric to explain, said Giani, but he recounted an anecdote about famed physicist Werner Heisenberg: that he once said it was the most important measurement done at the time, due to the way it explains the interactions of protons. TOTEM’s measurements of this parameter seem to imply that the Odderon exists. The team published their results online recently. They’re not direct measurements, Giani emphasised. But they’re still important, since they imply the existence of glueballs. Glueballs are particles that consist solely of gluons that are extremely hard to measure, but are predicted by the Standard Model of particle physics. They’re kind of like Odderons just floating around on their own, not ones that exist only when two protons are passing by each other.